Analog Alien guitar and bass FX pedals bring a refreshing new look to pedal boards. The difference between these pedals and their rivals is rooted firmly in their history. The pedals are produced by Cloud 9 Audio which is an offshoot of Cloud 9 recording - a small boutique recording studio which offers both digital and analogue recording. The gentlemen of the studio put together some guitar effects to achieve the sounds they were looking for, for use in the studio, and their clients were so enthusiastic about the results that eventually, and inevitably, they came to the conclusion that they needed to produce the pedals commercially. The pedals all have characteristic graphics and paint (often metal flake) to present a unique appearance.The packaging in which the pedals are delivered is also unique - varying from cool bags to lunchboxes and sometimes contain additional product - the Fuzzbubble comes with a pot of bubble liquid and the Alien Twister comes in a box with some Hot Sauce! All the pedals are for the most part analogue, although, inevitably, time based effects do contain a dash of digital. The first pedal released on an unsuspecting guitar community set the tone for the future - many of the pedals contain multiple effects, independently selectable and have an incredible fidelity to the sound. That first pedal was the Analog Alien Fuzzbubble 45. The Fuzzbubble contained a fuzz and an overdrive which could be switched between but not used together. The two footpedals are Bypass (no effect) and Effect (switches between Fuzz and OD). Originally the two effects were called Jimi and Pete - this gives you a clue as to the flavour of effect they were going after. Later these two were renamed Fuzz and OD - pragmatic but slightly less endearing! The fuzz is superb - three controls, In, Out and Haze - this is a very useable fuzz with a wide range of fuzz, distortion and overdrive sounds easily accessible - the Haze control, in conjunction with In, sets up the sound and the Out control controls the overall level when the effect is engaged. When you switch from Fuzz to Overdrive you will find a drive that works slightly differently from your typical pedal. It is voiced after a 1959 Tweed Bandmaster - an amp that was used to record every guitar track on Who's Next? (Pete - geddit?) This has just two controls - Out and Year. The unit is designed to be controlled by your guitar volume control and the Out control takes care of the overall level. The year control ranges from 67 to 77 and takes us from typical 60s low gain sounds right through crunch to the late 70s classic rock sounds. This overdrive is one of the huge highlights of the entire Analog Alien range. The next pedal we'll look at is the Analog Alien Rumble Seat. This pedal contains three discreet effects - drive, delay and reverb. 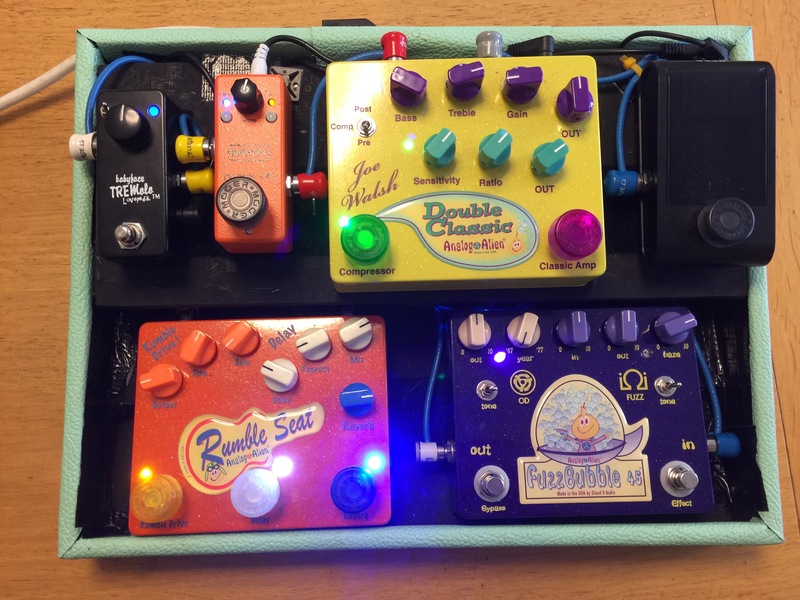 These can be engaged independently of each other and for many people the Rumble Seat might be the only pedal they'll ever need - it is effective in styles from Rockabilly to Pink Floyd and beyond. The all analogue Rumble Drive is voiced after a 69 Marshall Plexi and hits this nail right on the head (Billy Gibbons lives within this effect!) but the effect is flexible and adjustable using the Output, Gain and Tone controls. It operates effectively as a clean boost and tone effect with the Gain turned right down. James Burton has TWO Rumble Seats on his pedal board which must say something about its quality. You should note that the Drive section of the Rumble Seat is available as a standalone pedal called the Bucket Seat - if you have other solutions for reverb and delay this could be a good solution for you. The Reverb and Delay both use digital clocks but surround them with analogue circuitry to get that traditional tone. The Delay has the three classic controls - Delay adjusts the delay from 25ms to 650ms, Repeats controls the number of repeats and Mix governs the relative level of the repeats to the original sound. You can get anything from ADT to slapback through to longer repeats so often favoured by modern guitarists. Reverb is a single control effect based on a Fender Blackface - turn it up and down to vary the size of the reverb - one knob is enough on a Blackface amp and so it is here too! This is a stunning pedal and could be the centre of any pedal set up. Looking at the compressor, this has a lot in common with studio compressor and certainly the sound is closer to that than the typical pedal. People use compressors in various ways and the three controls - Sensitivity, Ratio and Output - should enable you to get what you want. It is very effective as a clean boost with the Ratio set to max, the Sensitivity control at the best point for your pickups and the Output governing the boost level. The drive section (or Classic Amp as it is named on the pedal) is modelled on a Tweed Deluxe that Mr Walsh has used extensively in the studio and this gives a different flavour from the drives in the Fuzzbubble and the Rumble Seat. It has four controls which will seem quite familiar to anyone who has used simple valve amps - Gain, Treble, Bass and Output. You can set up a wide range of souds with these but my preference was definitely a 5E3 type sound which really makes the guitar sound leap out of the amp. The Joe Walsh Double Classic also has a pre/post switch that selects the order of the effects (the compressor can either be pre or post the amp sound). It's tempting to place it first like a pedal but in many ways it works very effectively in Post mode - the amp sound being compressed as a typical studio compressor would do. Those three pedals are the ones I have used and continue to use.... as you can see I am a committed fan of Analog Alien. Alien Bass Station (Limiter, Gamma Fuzz and Amp Generator), a pedal for bass players favoured by Pino Palladino and appearing on more and more A-list bass pedalboards around the world. Alien Twister (Fuzz) featuring Input, Output and Stab controls! Power Pack - this is a new clean boost pedal that I can't wait to get my hands on. I wait with bated breath for an Analog Alien modulation pedal or two! Surely harmonic tremolo, phaser and maybe Univibe style must be on the way... don't you think?